The current Philips app is not focused on long term preventative care. I proposed a lifelong health data repository that fuels a digital health coach, to help transition healthcare into a system that is proactive about health, rather than reactive about sickness. I presented this project to a team at Philips, and received positive feedback about the project’s long-term aspirations and alignment to many of their goals. Health data is compiled in many different places through a person’s life, making the entire experience of healthcare fragmented and impersonal. How can the aggregation of health data make the experience of healthcare more holistic? How can this be used for preventative care, instead of our current system of sick care? Through a collaboration with Philips, I worked with service designers, marketing directors and other innovators at Philips, to come up with modifications to their existing health platform. I proposed a new user experience for aggregating health data throughout a person’s life time, as well as a new app that provides actionable health advice. I presented this proposal to a team at Philips, who provided feedback and useful steps forward. To see the final interactive prototype click here. I began with researching Philpis Wellcentive and their existing capabilities. Since they have already built long-term relationships with hospitals and other care providers, it made sense to build off of services they already provide. I prepared questions for my collaborators. For each person I interviewed, I customized my questions based on their role at the company. I also organized my questions into sub-themes, so that the conversation could flow a little bit more naturally. While I had a huge collection of notes, quotations, and new ideas, I needed a way to organize these interview notes. I started by categorizing these transcriptions into broad themes or categories. I then stack-ranked them in order of importance. Below are some of the insights I heard after speaking to my Philips collaborators. Below are the key points, within my Philips Wellcentive SWOT analysis, that I wanted to address. These points, gathered from my Philips interviews, press releases, and broad internet research, were the most relevant to the topic of preventative care. Create a platform for people to compile claims data, medical records, family history, genomics, etc., all in one place. With this lifelong compilation of health data in one place, preventative care could potentially become automated. After exploring several directions, I finally landed on this idea of a lifetime health data repository. To address the issue of data security, I decided to use a physical object that acts as your “digital key” to your personal health data repository that you can access through the Philips App. I thought about a lifelong user experience of this product and app. This repository of health data is most useful, in the context of preventative care, when it is compiled over a lifetime. I started thinking about how someone would engage with a health repository. There needed to be some benefit that this repository could provide. I thought back to what my Philips collaborators were saying about a health coach being important for patient engagement. How could I embed this idea into this app experience? Before moving to more high-fidelity wireframes, it was important for me to test if the value proposition of this idea even mattered to people. If the goal of collecting all of a patient’s health data, was to provide holistic health advice, I wanted to find a way to test if people thought this was useful. I did this by asking 5 diverse people of various age ranges, to be my user testers. Throughout the day, I texted them 5 different types of health notifications. Some were really severe, like “you are showing abnormally high blood pressure levels” and some were less severe, like “you haven’t been drinking enough water today.” With this study, I was focused on a higher level understanding of what people care about, regarding their health. Another major threat that I identified in the SWOT analysis, was that people may not feel comfortable having all of their health data in one place. The best way to find out, was just to ask them. I had 17 people fill out this survey, some older some younger. One of the main points of this survey was setting up the scenario in which I had sketched out in my ideation phase. This allowed people to make contextual decisions when providing their answers. After compiling the results I found the first inklings of a pattern that indicates that future generations may be more open to storing and sharing their data. I organized the respondents from youngest to oldest, and found that the younger respondents were comfortable storing and sharing their data with doctors and insurance companies. While more data is needed to support this theory, the fact that people were comfortable storing data, was enough to validate my idea. The existing healthcare system is one where our health and medical records are scattered in various data bases throughout our life. My proposal is an app and platform that promotes a life-long relationship with health and medical data. This aggregation of health data is used to power a preventative care health coach. Acts as a repository for user’s health data. Also acts as a physical-digital key for user to securely access their personal health data. Only transmits data, and does not store health data. A simplified user journey is shown below. The capsule, or health data repository, becomes an object that is kept with you throughout your entire life. After passing, the health data gets anonymized and passed on for research purposes. After doing an initial user flow sketch, I needed to get a more detailed understanding of how information flows through the app and affects the user experience. I fleshed out some of the critical components of what the information architecture would look like. The health repository section of the app is used to store and retrieve all health-related data including claims data, health and medical data, social and community data, genomic data, self-generated data, and family history data. 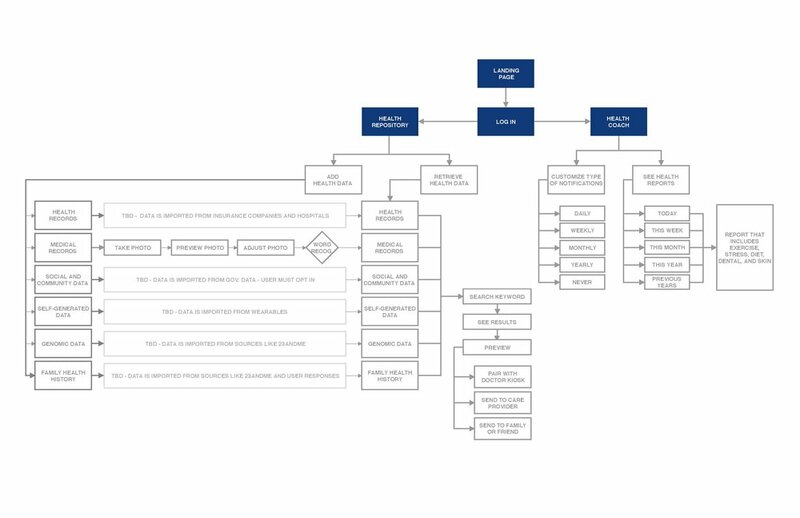 The user flow of (1) adding claims data and (2) retrieving health records are shown below. The health repository uses all of the users health data to power the health coach. One differentiating feature, inspired by user feedback, is the ability to adjust the frequency of notifications. Adjusting frequency would simultaneously adjust the type of notifications the user will receive. If monthly or yearly are checked, the type of notifications become more long term and possibly more severe (i.e. blood pressure trending too high over the past few weeks). I prototyped an interactive version of the app and had users test it. I asked users to decide which category they would store a specific type of health data. I asked users to name their health record and store it. I asked users to search for a specific health record. After the project was finished I was given the opportunity by one of my collaborators, Sonal Matai, to present to his team at Philips. Their feedback back was positive, but they primarily spoke about data integration being one of the biggest challenges within the industry. One of the ways they are able to occasionally sidestep this barrier, is through long-term partnerships and contracts with care providers and other major stakeholders. This was great insight into where the future of this idea could go. Next steps are to flesh out where all of the channels of health data come from. While I knew early on that I had to figure out where all of the health data comes from, the feedback from Philips provided great insight into how to achieve this within a project with such a large scope. The next steps for the development of this idea would be to study the competitive landscape more and figure out how to leverage partnerships as a key strategy for making this life-long health repository work.